PROSESS (Protein Structure Evaluation Suite & Server) is a web server designed to evaluate and validate protein structures solved by either X-ray crystallography or NMR spectroscopy. PROSESS integrates a variety of previously developed, well-known and thoroughly tested methods to evaluate both global and residue-specific: 1) covalent and geometric quality; 2) non-bonded/packing quality; 3) torsion angle quality; 4) chemical shift quality and 5) NOE quality. In particular, PROSESS uses VADAR for coordinate, packing, H-bond, secondary structure and geometric analysis, GeNMR for calculating folding, threading and solvent energetics, ShiftX for calculating chemical shift correlations, RCI for correlating structure mobility to chemical shift and Preditor for calculating torsion angle-chemical shifts agreement. PROSESS also incorporates several other programs including MolProbity to assess atomic clashes and His/Asn flips, XPLOR-NIH to identify and quantify NOE restraint violations and NAMD to assess structure energetics. 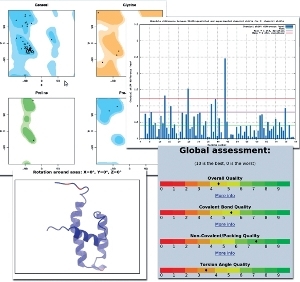 PROSESS produces detailed tables, explanations, structural images and graphs that summarize the results and compare them to values observed in high-quality or high-resolution protein structures. Using a simplified red-amber-green coloring scheme PROSESS also alerts users about both general and residue-specific structural problems. PROSESS is intended to serve as a tool that can be used by structure biologists as well as database curators to assess and validate newly determined protein structures. Reference: PROSESS: a protein structure evaluation suite and server; Berjanskii M, Liang Y, Zhou J, Tang P, Stothard P, Zhou Y, Cruz J, Macdonell C, Lin G, Lu P, Wishart DS. ; Nucleic Acids Res. Webserver Edition; 2010. 5) Press the submit button. The results will be displayed on the web in 5-30 min depending on your model. If you enter email address, you will also receive an email with links to results. 6) Print PROSESS results as soon as you receive email notification that your PROSESS job is finished. PROSESS job files are stored on the server for 3 days. - Your PDB file, NOE file, and chemical shift file must have identical residue numbering. - Residue numbering for sub-units of dimers, tetramers, and other multimers must not overlap. with combined primary sequence entries. - If you submit an ensemble, the minimal size of an ensemble should be 3 models. Problems? Suggestions? Please contact Wishart group.